Bright green in color, Rose Carrarini's cookbook 'Breakfast Lunch Tea' stands out on my bookshelf. This book pays a lot of attention to design; from the paper which is thick and ivory colored, to the easy to read black print, to the pictures (and there are lots) that have a lovely old world feel to them. The recipe selection (about 100 in all) will definitely entice you to get into the kitchen. As the title of this book suggests, there are both sweet and savory recipes for breakfast, lunch and tea. In fact, the recipes are all used in Rose Carrarini's bakery (called Rose Bakery) located in Paris France. One adapted recipe that has become my family's favorite is her Honey Granola. It contains a mixture of old fashioned rolled oats, whole almonds, and seeds (pumpkin, sunflower, and sesame or flax seeds) that are all coated in a sweet mixture of honey, brown sugar, oil, ground cinnamon, and vanilla. Very easy to make and so adaptable. It is important to turn the granola frequently as it bakes so it browns evenly and watch it carefully towards the end of baking, as it burns quite easily. It is also important to cool the granola completely before storing in an airtight container as you do not want it to lose its wonderful crispy texture. A few notes on ingredients. I like to use old fashioned rolled oats as they have a thicker texture than quick cooking rolled oats. I have used natural (skins on) whole almonds but you could use blanched whole almonds. Or you could use other nuts. For the seeds, use raw seeds. 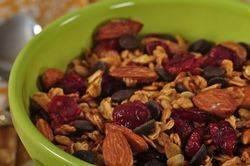 For this granola I have used sunflower, pumpkin, and either sesame or flax seeds. Again you can vary the type and/or amounts if you like. For the honey, I used liquid Clover Honey which has a mild floral flavor. Orange Blossom Honey is another good choice as it has a wonderful citrus flavor. You can eat this honey granola as you would any other cereal; with milk. Or you can add some dried fruit and eat it as a healthy snack. It will keep for several months if stored in an airtight container in the refrigerator. Honey Granola Recipe: Preheat your oven to 325 degrees F (165 degrees C) and place rack in the center of the oven. Either butter (oil) or spray a baking sheet with a non stick vegetable spray. In a large bowl combine the rolled oats, nuts, seeds, wheat germ (if using), ground cinnamon, and salt. In a small saucepan, stirring constantly, bring just to a boil the water, oil, honey, brown sugar, and vanilla extract. Pour this mixture over the dry ingredients and toss together, making sure all the dry ingredients are coated with the liquid. Spread onto the prepared baking sheet and bake for about 35 - 40 minutes or until golden brown, stirring occasionally so the mixture browns evenly. (The browner the granola gets (without burning) the crunchier the granola will be.) Place on a wire rack to cool. You will notice that the granola may still be sticky and soft when it is first removed from the oven, but it will become crisp and dry as it cools. Make sure to break up any large clumps of granola while the mixture is still warm. Once the granola has completely cooled, store in an airtight container or plastic bag in the refrigerator. It will keep for several weeks. Can serve plain or with dried and/or fresh fruit and milk.